After all the digging, composting, dewatering and other water problems, the day to plant finally arrived. 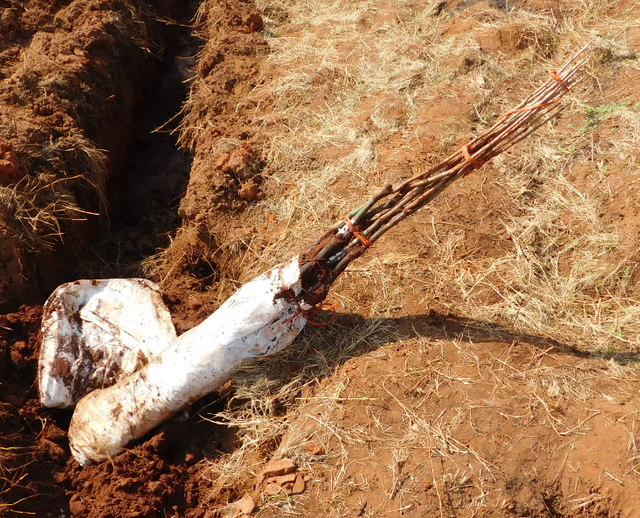 The trees are grafted trees and in this case we planted bare root trees since they are far more economical to transport over long distances. They come in bundles of 10 with their roots rapped in moist sawdust inside a bag. The individual trees look as follows. A branch less stem with a larger tap root. Both have bee trimmed to a more uniform size for transport. 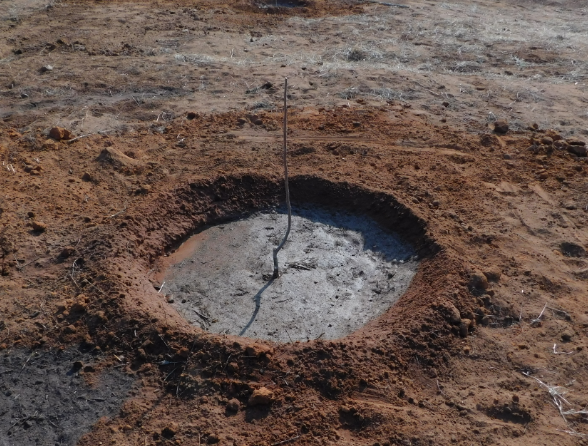 The hole is filled with water before it is filled with compost and soil while the tree is held in place. 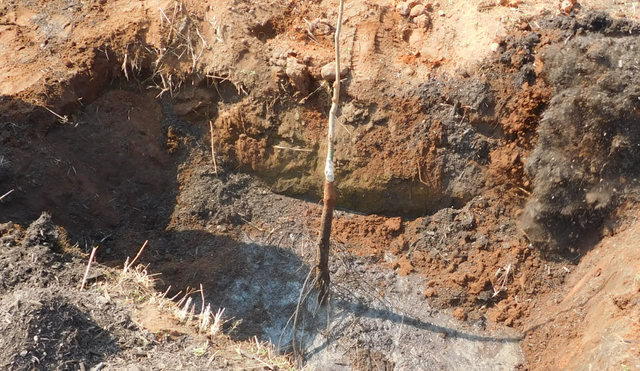 The tree is marked with at least one colour to indicate the variety and a white band to indicate where the root was previously in the soil. 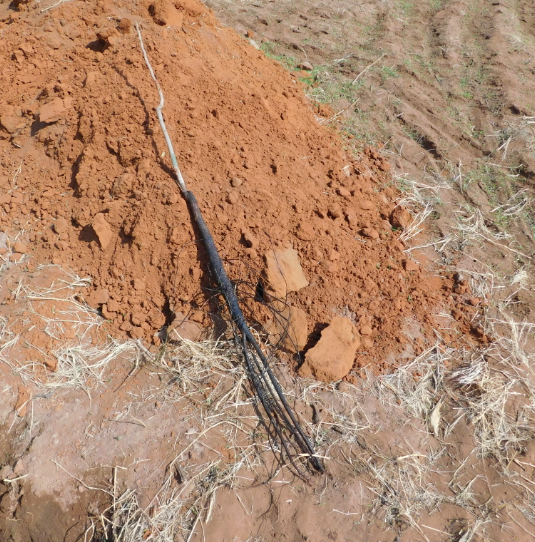 This must be covered to prevent sunburn of the root it it is left exposed. 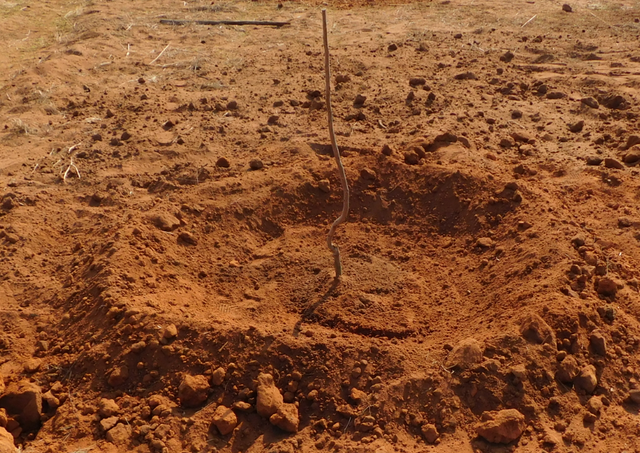 The soil is then shaped with walls to hold water at watering time. After the tree has been watered and the water has sunk in. Now, that's productive work. Looks like you made the circle with a compass and made sure you put the plant all over the center. It looks geometrically great! A wonderful overview and an interesting method for gardening! awesome, how many trees and how will you harvest them when they are ready? Like your post. More pecan farms are popping up in the Northen Cape Province of South Africa, and it is truely a lovely sight. Man... pecan nuts... now those are delicious. How much time does it take for the tree to grow from that point on the picture until it produces Pecans though? 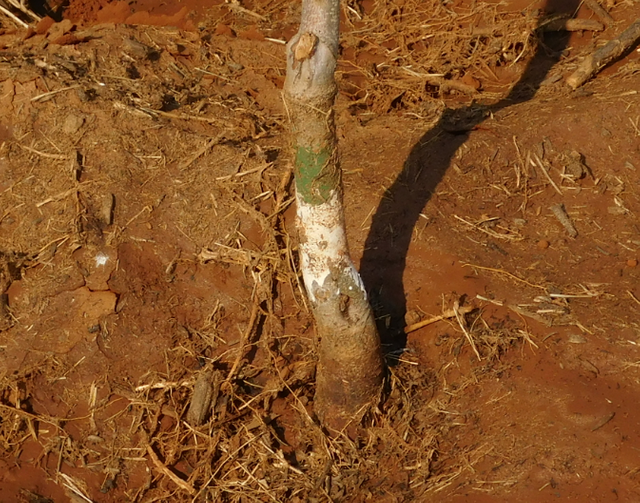 You made really great work to grow up tree from nut in such difficult conditions!